Well I can’t complain, our high desert is becoming alive with life ( duh, what else can you come alive with) in the form of flora and creatures. I was down low photographing a pretty purple and yellow tahoka daisy, when I caught a quick glimpse of this little creature fly past. 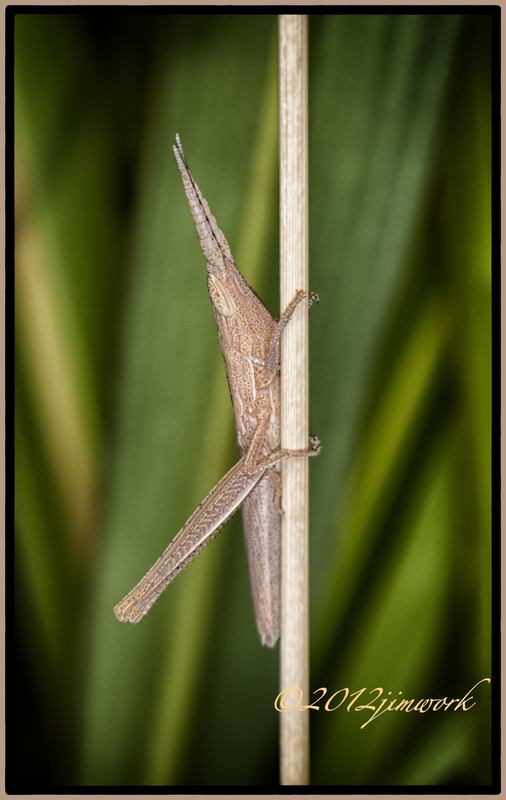 I was fortunate enough to spot this little (3/4 -1″) long nosed grasshopper literally clinging to piece of grass. I so enjoyed the way his little feet had such a desperate grip. He was very patient with me and allowed me to inch to within a foot or so to his slender frame. Not a lot of color, but a lot of character. LOL @ your comment there. What a nifty looking critter. Wow! Puts a smile on my face.